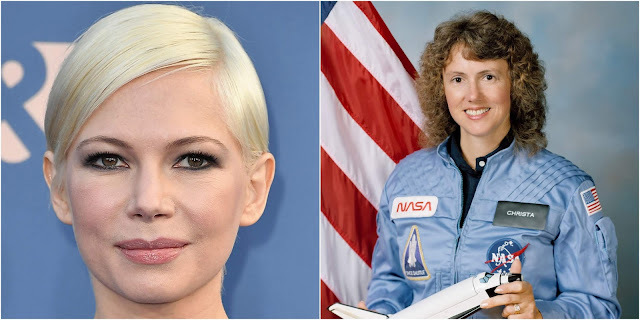 Variety is reporting Michelle Williams will star as the late astronaut Christa McAuliffe in the drama “The Challenger,” centered on the 1986 Space Shuttle disaster. Producers are John and Art Linson, and Argent Pictures’ Ben Renzo. Martin Zandvliet will direct “The Challenger” from Jayson Rothwell’s script. Argent partners Jill Ahrens, Ryan Ahrens, Drew Brees, Tony Parker, Michael Finley, and Derrick Brooks are executive producing the pic. Production is expected to start in May. Williams has been nominated for Academy Awards for “Brokeback Mountain,” “Blue Valentine,” “My Week With Marilyn,” and “Manchester by the Sea.” She recently starred in “All the Money in the World” and “I Feel Pretty,” and will next be seen opposite Tom Hardy in “Venom,” which opens on Friday. Williams has been shooting Bart Freundlich’s “After the Wedding” with Julianne Moore. She is repped by WME, Brillstein Entertainment, and Bloom Hergott Diemer Rosenthal. The news was first reported by Deadline Hollywood.